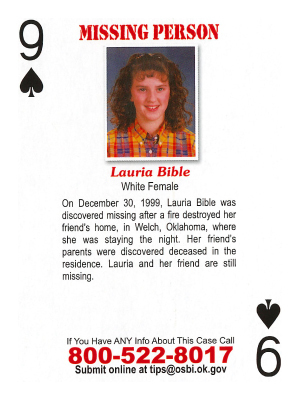 On December 30, 1999, Lauria Bible was discovered missing after a fire destroyed her friend's home, in Welch, Oklahoma where she was staying the night. The parents of Bible's friend discovered the deceased in the residence. Lauria and her friend are still missing.